In -10-degree temperatures in downtown Detroit, we needed something to warm us up – and the hottest car tech at the North American International Auto Show certainly did that. The biggest names in the auto industry gathered to show off their new vehicles – both consumer and concept, and here's our pick of the techiest developments on offer. First up is Ford's uber-powerful GT – now sporting Corning's Gorilla Glass in its windshield. Ford and Corning's boffins (dressed appropriately in white coats and googles) were demonstrating the strength of the windshield by firing a solid ball of ice at it at high speeds. As well as being as tough as, an er, gorilla, the new windshield tech is significantly lighter – improving handling by lowering the car's CG. Elsewhere on the huge ford stand (we say a stand, it's more like a mini city) the company unveiled its new Fusion – a model its calling its 'smartest, most technology-packed Fusion ever'. There are a few new models, including plug-in hybrids (Fusion Hybrid and Fusion Energi) and the pacey Fusion V6 Sport. There's also the Fusion Platinum for a more luxurious cabin experience. Our interests lie firmly in the Energi, which features a 7.6-kilowatt-hour lithium battery for an expected range of around 19 miles using e-power only. Ford claims it can be charged in just 2.5 hours. But the real tech comes in the form of Ford's new pedestrian detection system, lane-keeping assist, cross traffic alert sensors, hands-free parallel parking and of course SYNC 3 ­– which, as we saw at CES, will soon communicate with Amazon's Alexa and Echo, potentially enabling you to control home lighting, temperature and garage doors from your car, as well as pre-conditioning and starting your car from your sofa. 'Alexa, start the car'. In other Ford developments, the company announced Ford Pass. A new scheme 'aiming to do for car owners what iTunes did for music fans' Nope, we don't understand that either. Basically Ford Pass gives you a load of benefits for driving around in your Ford – like parking assistance, free coffee and snacks and access to on-call guides which will help you find what you need in the city you're in. More interestingly, Ford in also opening up a number of 'FordHubs' around the world (New York, San Francisco, London and Shanghai) where you can go in and experience the company's latest tech. Moving away from the blue oval, we were mightily impressed with Audi's h-tron quattro – a hydrogen-powered concept car with a range of 372 miles (take that, Tesla). The tanks, which sit below the passengers, can be refuelled in just four minutes. Every tank is made up of several layers – the inner tank from gas-tight polyamide is wrapped in carbon fibre reinforced polymer and glass fibre reinforced polymer. Complementing the cells is a lithium battery – supplying up to 100Kw of power for a burst when accelerating. And it'll reach 62mph in less than seven seconds (OK Tesla, you can have that one back). Naturally, the concept is zero emissions. There's no denying this car is stunning – Audi summing it up with almost Jony Ive-worthy hyperbole: 'The flowing shoulder line forms distinctive blister contours above the wheels in an expression of the electrified quattro drive. Wide wheel panels and angular side sills underscore the robust character of the car.' You'll also notice that there's no exterior mirrors – Audi has replaced these with cameras, of course. Inside, the car is equally as impressive. There are three large OLED displays , two touch displays and even the steering wheel has 'contoured touch surfaces'. And of course there's a bevy of driver assistance features here, the system computing a complete model of the car's surroundings in real time – all meaning the car can take over driving on motorways up to 60mph (along with auto parking, of course). 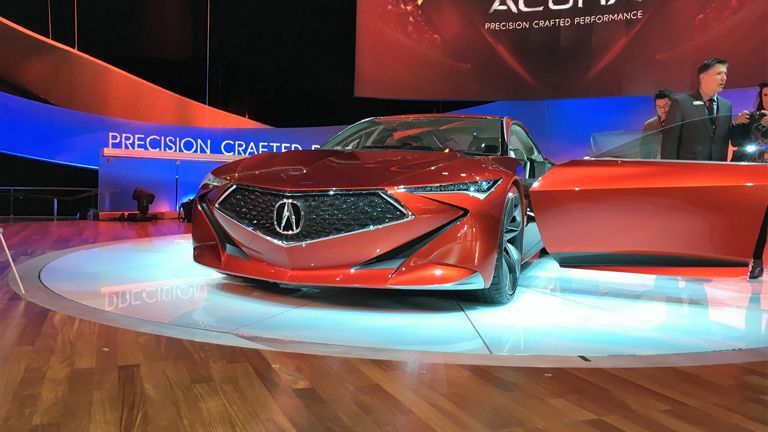 Sticking with concepts, there's perhaps no more beautiful car at NAIAS than the Acura Precision concept. It's jaw-droppingly gorgeous as you can see. Developed in the Acura Design Studio in California, the design emphasis was, according to the company 'the intersection of modern, sheer surfaces and muscular, organic sculpting'. This motor is ultra-low and wide, with a long dash-to-axle ratio, deeply sculpted surfaces and a new Diamond Pentagon grille that is nothing like we've seen before. There's also 'Jewel Constellation LED headlights composed of organically arranged fractal elements, and in back with floating LED taillights'. And the doors open backwards, which we liked. The interior is pretty damn lovely, too. Hand-crafted speaker grilles made of 'exotic wood' (not just wood) and the HUD and curved centre display screen are simply gorgeous. It'll be a while before we see anything like this and the h-tron on the road in the UK, but we like where it's going. Very much. Volkswagen was also on the floor, neatly sidestepping questions about emission. Well, we presume it was, because we were too busy checking out its new Beetle Dune concept; an even more modern take on the modern classic. The Dune concept has a sportier, wider body with brushed aluminium sill trim panels and a black honeycomb screen at the front that morphs into the underbody protection of the car. Under the hood there's a 210-hp turbo direct injection 2.0-litre four cylinder engine with a six speed dual clutch auto transmission – and it's front-wheel drive. But the standout for T3 comes inside the car; the centrepiece being the 7.7-inch AMOLED display. The concept integrates the VW Sideways app – enabling you to not only find POIs nearby but also if your friends are there as well. It also integrates info such as the weather into POIs, VW using the example that you wouldn't be guided to an outdoor swimming pool in winter. That just sounds like common sense to us, but hey. The digital display of the car's pitch and roll is a tribute to the New Beetle Dune of 2000, which integrated the functions in the main instrumentation. Hyundai luxury brand Genesis (whose logo looks remarkably like Aston Martin's) had a tech-packed car to show off in the form of its G90 - a 3.3L Twin Turbo V6-powered beast with 365 hp. Inside it features Genesis Smart Sense – which brings together highway driving assistance, advanced smnart cruise control and lane keeping assistance. Whilst it may look like a (rather swish) regular 4x4, Kia has integrated some crazy cool tech into its Telluride concept. We think we'll let Kia explain (as it's too mental for us to paraphrase). 'All four seats include a series of precise diamond-cut openings in the seatback, each embedded with Smart Sensors to capture a passenger's vital health information. Once obtained, these vitals are displayed on the interior door panel screens, which then systematically synchronize with a Light Emitted Rejuvenation (LER) system. The LER system utilizes a massive, wing-shaped LED panel mounted beneath the oversized sunroof that displays a pattern of therapeutic light to treat desynchronosis (jetlag) and improve the passengers' energy levels.' Say what? Another cool piece of tech is Swipe Command – a thin, touch-sensitive, interactive band mounted to the second row center console enabling rear-seat passengers to quickly scroll and select desired media by simply swiping their hand. The selected media is then played either through the seven-speaker premium Harman Kardon audio system (yes, seven speakers), or via a set of portable Harman Kardon headphones that wirelessly charge when stowed in the console. Elsewhere we saw the new Porsche 911, Toyota's Scion concept that was unveiled at the LA Auto Show last year and Nissan's Titan Warrior concept that dwarfed this humble editor. We also checked out Volvo's XC90 and Volvo's On Call app, enabling you to not only pre-condition and start the car, but also get your shopping delivered to it. The NAIAS show continues at the Cobo Centre in Detroit until 24 Jan.